U.S.: The S&P 500 slumped nearly 300 points Thursday, as trade tensions and bleak economic data from Europe renewed fears of a slowdown in global growth. Investors have grappled with conflicting signals about the durability of the global economic expansion this year, something that has kept enthusiasm for risk-taking contained even after markets rallied in January. Major U.S. indexes opened lower, tracking declines in Europe, and extended their slump after White House economic adviser Larry Kudlow said China and the U.S. are still far away from striking a trade deal. A White House official later said President Trump is "highly unlikely" to meet with Chinese President Xi Jinping ahead of the March 1 expiration of their tariff truce. The S&P 500 lost 0.9% after snapping a five-day winning streak Wednesday. - Trade-sensitive stocks, including machinery giant Caterpillar, aerospace company Boeing and chip maker Intel, all shed at least 1.5%. EUROPE: European markets slumped Thursday, led by heavy losses for German stocks after more weak data from that country, and as earnings news hit the banking sector. Further, the Bank of England and the European Commission both offered downbeat outlooks on Thursday, reaffirming growing fears about the health of Europe’s economy. The Stoxx Europe 600 fell by 1.5% to 360, after closing up 0.15% on Wednesday. LOCAL: The Australian sharemarket closed at four-month high on Thursday as better than expected results were rewarded with strong gains, leading the ASX 200 to rise 1.1% to 6093. - The major banks led the market on Thursday, extending their gains for the week and giving the market its fourth straight gain. Commonwealth Bank led the gains rising 2% to $74.06, Westpac climbed 1.9% to $26.88 and ANZ edged 1.7% higher to $26.86. NAB shares advanced 1.3% higher to $24.93 before entering a trading halt in the final hour of trade, pending an announcement on leadership changes. - CYBG shares rose 17.9% to $3.76 after it delivered an upbeat December quarter trading update following the close of trade on Wednesday. The British bank said it experienced greater than expected synergies from it purchase of Virgin Money in October and expected to deliver a minimum of £150 million ($273 million) in savings by the end of its 2021 financial year, beating its initial forecast for £120 million. The Australian equity market produced strong returns in January, gaining 4% for the month on more upbeat global sentiment towards stocks. 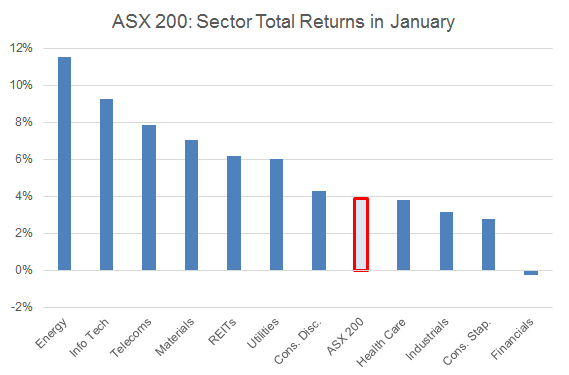 All sectors bar financials rose, which were weak leading into the final Royal Commission report (and have since rebounded). The effect of a weak performance from the large financials sector was a key drag on overall performance, with seven out of eleven sectors beating the index.